Hey everyone. My troupe and I just bought into FG in order to play some new World of Darkness games online, and I have recently set to making a 'ruleset' for use with all of the nWoD material. I know that there is another person on here who has been working on a World of Darkness conversion for some time, but I also know that he has gone silent as of late. In addition, the nWoD is the kind of system that does not require a program to make automatic rolls for a player in the way that Fantasy Grounds does for D20. In fact, the game is actually quite hampered by this automation since one of the major mechanics of nWoD is that every die roll is subject to a slew of modifiers which directly affect the number of dice rolled. The only sure thing when making a roll using this system is that you will not roll the number of dice listed on the character sheet. Therefore, such functionality is unnecessary. My efforts will be to create a ruleset for nWoD that mainly changes the artwork of the program to make it more suitable for modern-type games and to create character sheets and resources that merely record data like a piece of paper would. I don't intend to have the system check for bad data (like someone filling in the fourth dot of a stat without filling in the second or third), or make any rolls automatically. In the long run, I think this will be a more fun system. 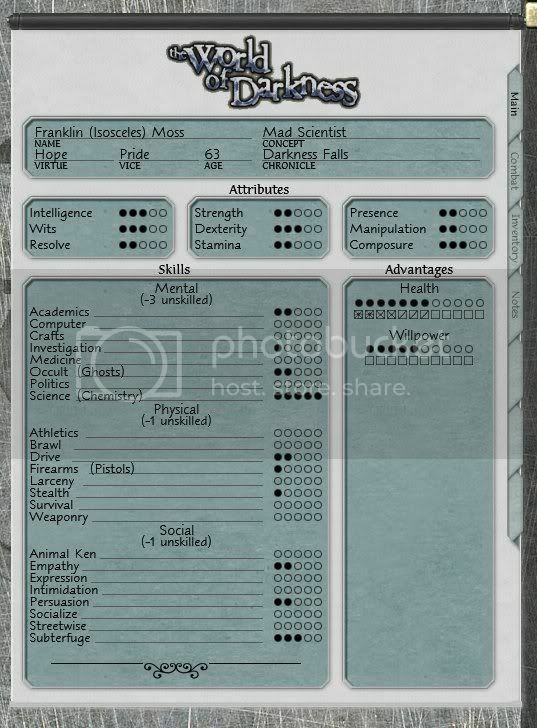 Here's a screenshot of my character sheet's work in progress. Please feel free to offer any suggestions. I will try to keep this thread up to date. If it's possible, I will upload the ruleset package as soon as I get it to the point where our group intends to use it (or before if someone really wants it). By the way, our group is playing a game of mortals, so the character sheet reflects that. 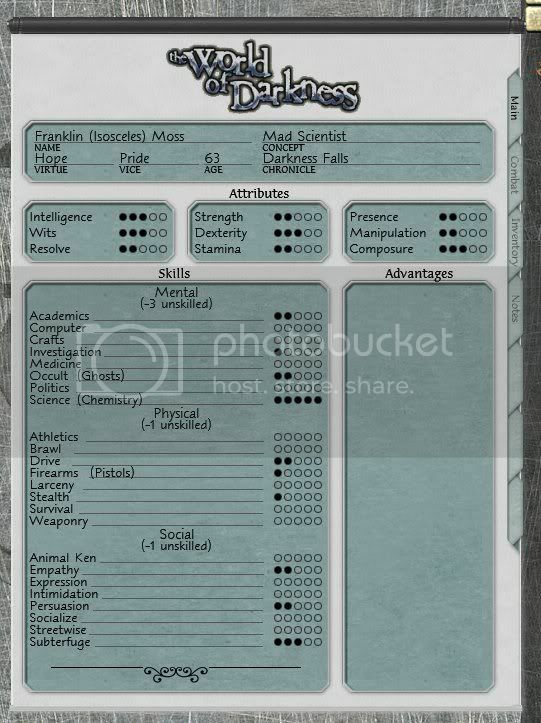 I imagine that if we wanted to transition into a Mage game or something, it would be relatively simple to alter the character sheet to accomodate Mage stats. Yes please though i would ask can you make a character sheet for Scion as well. Well, at this point, Scion is the one White Wolf game that I do not have. I came late to this stuff and am currently playing catch-up. I have all of the nWoD game lines and a lot of the Exalted stuff, but no Scion as of yet. It should not be difficult to modify my ruleset to accomodate Scion, though. It might only mean just adding an extra tabbed page to the sheet to list all of the Scion's powers. The most difficult thing that I can foresee about this process is making a way to track health like you do on a paper character sheet. I think that the database will have to track each health box separately, with four different health box graphics for the four various health states. This looks great, I can't wait to see it in action! Thanks, Slu! Lord willing, you'll see it in two days! Now, here's my current work in progress. I have added all of the skills, plus fields to be able to write in specialties. There's got to be an easier way to do this than what I am doing. I saw something in the reference (is it just me or is the XML reference far from exhaustive?) that mentioned relative placement. That may help me immensely, but I haven't seen an example of it in the D20 set, so I am unsure as to how to use it. Well, I am now officially so stinkin' proud of myself that I can't help grinning. I figured out how to make little health boxes that can be tracked properly according to World of Darkness rules simply by clicking on the boxes. Ultimately, I created a hybrid of the checkbox template with four states instead of two (one for 'empty', one for 'slash', one for 'cross', and one for 'asterisk'). This thing is coming together better than I ever thought I could make it. I will create another hybrid checkbox template for willpower boxes. Only two states are necessary for them - empty and slashed. All that remains to be done to the front page is the morality scale and the basic advantages. I would welcome any comments or suggestions. One thing that's in the back of my mind for a World of Darkness ruleset is the rolling of the dice. With the dots as they are, you can pick up the correct number of d10 from the dice under the chat box and roll them. This is fine. It would be nice if you could combine the Skill+Attribute on the character sheet and roll from there. What you could do is add a diecontrol box at the bottom of the Advantages section, which would allow you have an area to combine rolls. Then an OnDoubleClick() and/or an OnDrag() action on this control to roll the combined Skill+Attribute roll. An OnDrag() action on the attributes and skills would allow you to drag the correct number of d10 (based on the dots) to the diecontrol and add a description. Except for the fact that all die rolls are subject to modifiers. My Dexterity + Firearms roll will be subject to a different amount of armor, cover, range, and visibility modifiers every time I roll. My Dexterity + Larceny roll for lockpicking will be subject to modifiers for tools and lock difficulty. And on and on it goes. All of these modifiers add and remove dice from the pool, changing the number rolled. Now, I admit that I haven't played nWoD very much. In fact, this Thursday will be my first official game as Storyteller. But it seems to me from reading the books that there will not be many 'pure' rolls made. That was certainly the case when my troupe and I did some combat tests last week. My current way of doing easy rolls is to have the F1-F12 keys set to roll between 1 and 12 dice, so after the Storyteller tells you how many dice to roll, given appropriate modifiers, you just hit that F key. Now, I run into a problem with this in that the F12 key will not hold 12 D10s after you shut the program off. Does anyone know what the deal is with that? You should look at some of the threads about the shadow run ruleset. I believe they use some sort of similar system where instead of modifiers you gain extra dice. I believe Joshua posted some code/sample code where the modifier stack became dice instead of a raw number. I've never even looked at WoD but from what you describe, that sounds like what you need. Hey, thanks for the heads-up. I absolutely love the Shadowrun game, by the way. I think I've had more fun with that system than any other. I'm just not sure that all of this auto-rolling would be helpful at all. I mean, by the time you clicked on all sorts of modifiers and such, you could have just hit the F7 key or whatever like 30 times. For me, the character sheet is just a way for the Storyteller to have access to the player's stats (like if I want to make a secret perception roll). Also, the players have to wait for me to give them all the modifiers before they can roll, and by the time I tell them, they already have a number, so they can just hit the corresponding F key. The new World of Darkness system is very sleek mechanically. The rolls don't really get in the way of the roleplaying. I think that by putting in a lot of complicated stuff into the ruleset for Fantasy Grounds, that would be working counter-productive to the feel of the system. I'm not really sure how a person goes about sharing homemade rulesets like this, but if there is a way, anyone who wants this when I'm done will be welcome to have it. Like I said before, though, I won't put together a special ruleset for Mage, Hunter, Exalted, or any of the other systems until my group decides to play another system, but I can easily envision how to hack what I've got to quickly make a sheet for a different system.